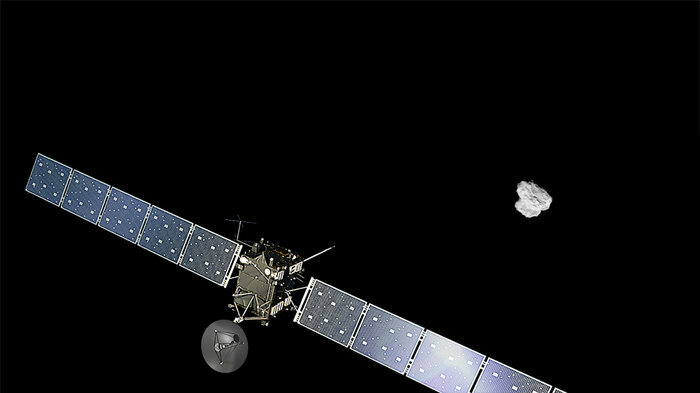 June 23, 2015 – The European Space Agency confirmed today that its Rosetta mission will be extended until the end of September 2016, at which point the spacecraft will most likely be landed on the surface of Comet 67P/Churyumov-Gerasimenko. Comet 67P/Churyumov-Gerasimenko will make its closest approach to the Sun on August 13, 2015 and Rosetta has been watching its activity increase over the last year. Continuing its study of the comet in the year following perihelion will give scientists a fuller picture of how a comet’s activity waxes and wanes along its orbit.